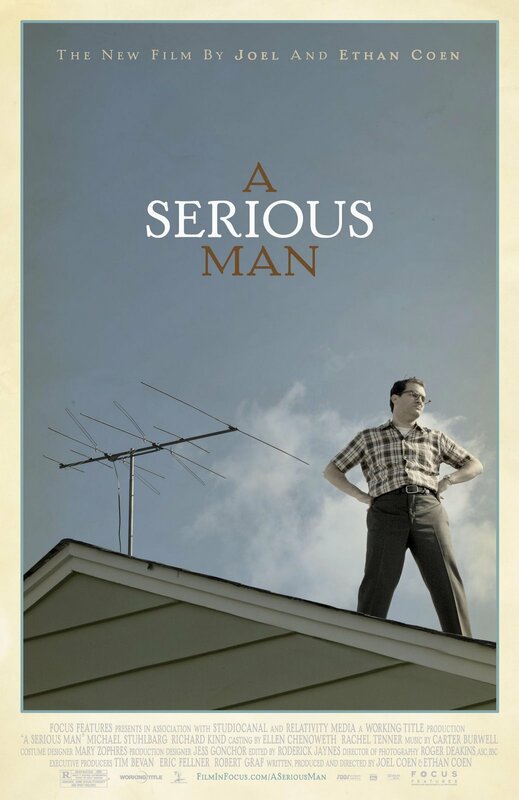 A Serious Man, 2009 / The Coen Bros.
Next, we meet the main character, Larry Gopnik (Michael Stuhlbarg). He is already on a sloping plain towards the disintegration of his so far stable and respectable life. Actually, his story reconfirms the Coens’ reputation of being quite cruel to their main characters. Larry undergoes a thorough medical check, including an X-ray scan, and it all seems to be fine, as far as health is concerned. The next problem crashes upon Larry’s head in the shape of Clive, a student (Larry is a physics teacher) disgruntled with his F grade, who seems to try to bribe Larry by discreetly leaving him an envelope with cash. Larry would try, unsuccessfully, to extract himself out of this embarrassing situation, all the while expecting the school’s decision on granting him a tenure. At home, the problems keep mounting. His Nazi/extreme Republican-looking neighbour is obviously trying to claim a portion of Larry’s own front yard. Larry’s brother lives with Larry’s neurotic family and doesn’t seem to come out of the bathroom, let alone start looking for a place of his own. And Larry’s wife demands a ritual divorce, informing him of her closeness with fellow Jew, Sy Ableman. Back at school, there follows an amusing scene involving Larry and Clive, the disgruntled student. Larry confronts him on the issue of the attempted bribe. Larry wants Clive to understand that actions always have consequences, while Clive agrees that “yes, they have consequences OFTEN”. This seems to enrage Larry, who for the first time mentions his moral convictions. Actions have to have corresponding consequences, right? And Larry has been a good man, a serious man all his life, trying to be morally upright, always trying to do the right things. So, the consequence to this has to be a good, morally upright, stable life. Not much to ask, right? Well, suddenly this does not seem to be the case with Larry, and he’s getting more and more lost with every new misfortune that comes crashing upon his head. In a following scene, Sy Ableman, unable to get in touch with Larry, appears at his doorstep. Sy is a superficially gentle, kind, soft-spoken, but also oily, large-framed figure. A truly passive-aggressive man, he professes his love for Larry (and seemingly all human beings), touches, caresses and hugs him, while trying to talk him into agreeing to a “gett”, a ritual divorce that would allow Sy to marry Larry’s wife “in the faith”. Later, it will be suggested that Sy has written anonymous letters to the school committee responsible of the decision on Larry’s tenure, slandering him. Sy could be viewed as a figure inspired by the Devil, though this is in no way consistent with the fact that Sy actually dies in a car accident – thus providing Larry with a measure of relief in his misfortunes. Urged repeatedly by Danny to fix the TV aerial on the roof, Larry climbs up, and sees the wife of one of his neighbours, sunbathing full naked. Temptation is brought into the story, but to the morally correct Larry this simply seems like one more piece of misfortune. In yet another enchanting scene with Sy Ableman, it is suggested to Larry that he should move out of his home and to a hotel. I can’t help but mention Sy’s extraordinary vocabulary – he refers to the hotel’s room as “eminently habitable”. Fred Melamed’s performance as Sy is a joy to observe again and again. There follows a scene that seems quite important to me. Clive’s father comes to visit Larry, and threatens to sue him for defamation – for suggesting Clive has tried to bribe him. When Larry offers that they simply forget about it all, the father demands that Larry gives Clive a passing grade. Larry declines. Then the father says he’ll sue him – for accepting a bribe. Larry counterattacks: “So there was actually a bribe?” The father counter-counterattacks: “This is defamation!” Larry does not see the sense in this – either there’s was a bribe, or there wasn’t. Accept the mystery, is the father’s response. The thing is, Larry is unable to accept the mystery. He needs answers why this is all happening to him. Unable to find them in logic or moral laws, his next step is to turn to a rabbi. Before his visit to the first rabbi, Larry expresses the questions on his mind verbally for the first time, in a conversation with a female friend. The first rabbi is actually rabbi Scott (Simon Helberg from “The Big Bang Theory”), the young deputy of rabbi Nachtner, whom Larry goes to see originally. Inexperienced but passionate, rabbi Scott gives Larry probably the most useful, and definitely least obscure advice out of the three rabbis. Still, this advice does nothing to help Larry decipher the cause of his misfortune and see the path he should take. The second rabbi, rabbi Nachtner, chips in with the extremely amusing and well-shot story of “The Goy’s Teeth”. Basically, it’s another instance of Larry having his hopes of finding explanation dashed, in a way that actually increases his confusion. The second rabbi is older, presumably wiser, and his advice is ultimately… blander. To Larry, it now seems being wise has to mean being bland, being non-active, not really caring. His universe is shattered. However, Larry continues to see this new situation as a chapter in a story – something has to happen, this is not the end of it, there will be developments that will shed light on all the confusion. So he is now desperate to see the third rabbi. The fact that that third rabbi – rabbi Marshak – is impossible to through to, only spurs Larry on, increases his frustration, but somehow preserves his dying hopes of clarity still alive. Soon after comes a scene where Larry teaches a class at school about “the uncertainty principle”. Scribbling a large blackboard full of complex mathematical formulas, he proves by the means of mathematics (probably his only pillar of stability left in the world) that… nothing is certain. As his students leave, he shouts after them that even though they can’t figure anything out, they would still be responsible for this at the exam. A scene that closes the cycle of the “three rabbis” shows Larry desperately trying to make his way past rabbi Marshak’s door, only to be rebuffed. Has Larry met the ultimate failure? And as it appears as if it cannot get any worse… it doesn’t. Rays of hope break through the clouds above Larry. His son, Danny, passes his Bar Mitzvah, an occasion for the family to get together and feel hope for the next generation. Sy Ableman is gone and there is a hint that Larry’s wife might have a change of heart and take him back. The slandering letters sent by Sy Ableman have stopped, and the school committee finally grants him his tenure. At the same time, Danny is granted access to rabbi Marshak, who gives him the most obscure of advices – quoting the omnipresent Jefferson Airplane song, and restoring to Danny the portable radio. How this radio has found its way to the hands of this biblical looking old man is a mystery which the Coen Brothers willingly leave unresolved. But, innocently, Danny seems to understand what his meeting with rabbi Marshak is all about. So Larry helps Clive. In the next instant, his phone rings. His doctor – remember, the one giving Larry a general medical check at the very beginning of the movie – wants to discuss with Larry his X-ray results. In private. So Larry probably has cancer, we’re led to believe. Why is this so? Is it a mystical consequence of Larry’s action – betraying his morals by changing Clive’s grade? But no, because the X-ray tests were done much earlier. We, people, are the one choosing to “read signs”, design our own imperfect explanations of the inexplicable, search for archetypal story arcs in our daily lives, believe in the power of the combination “action-consequence”. According to the Coen Brothers, all we need to do is to accept the mystery. With the good and all the bad it brings us. Asking questions and looking for their answers is absolutely pointless, in the grand scheme of things.